This 18.4-inch Android device can be acquired from the carrier for as low as $99.99 USD, when tied to a new two-year wireless contract and the DIRECTV service. 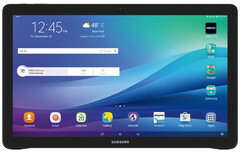 The Samsung Galaxy View "movable display" is currently the largest Android tablet on the market, its main purpose being to allow comfortable multimedia content consumption. This 18.4-inch device can be already acquired in the US directly from Samsung, but soon those interested to purchase it next to a wireless plan will be able to get it from AT&T as well. In addition to the above, the Samsung Galaxy View can be added to a new or existing Mobile Share Value Plan for an additional access charge of $10 per month. For more details, please check the press release below. Storage: AT&T’s Galaxy View comes with 64GB6 of storage, with expandable memory up to 128GB7, so you can download your favorite videos, music and more. Portability: Use the Galaxy View’s built-in kickstand in TV-mode to watch the game while you grill, or stand upright into Lap-mode to read comfortably. Turn up your music’s volume while its powerful speakers provide serious sound. Long-lasting Battery: With up to 8 hours of continuous play or watch time8, you can binge-watch, game and browse for hours without having to pause the action. 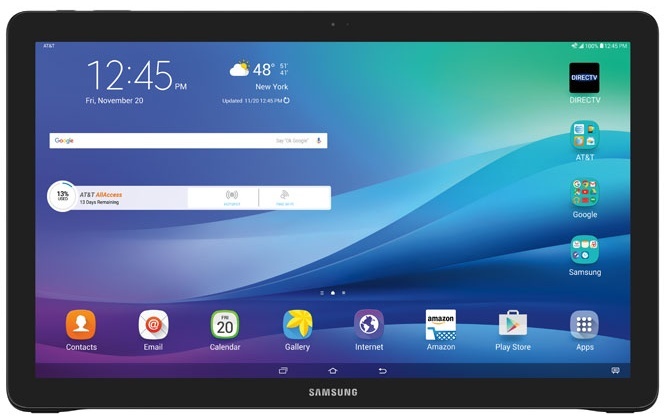 The Samsung Galaxy View earned 4 of 5 stars, on AT&T’s Eco-Rating 2.0 system. The 2.0 system rates the social and environmental factors of AT&T branded handset devices and tablets. AT&T created the Eco-Rating 2.0 system to empower consumers to make better informed decisions when selecting a device. For more information about this device’s rating, AT&T’s Eco-Rating 2.0 System, and how you can join AT&T in making a difference, please visit http://att.com/ecospace. For more information on the Samsung Galaxy View, check out this Mobile Minute video and visit: att.com/GalaxyView. Follow the conversation on social media by using #GalaxyView. © 2015 Samsung Electronics America, Inc. Samsung and Samsung Galaxy View are both trademarks of Samsung Electronics Co., Ltd.
1AT&T products and services are provided or offered by subsidiaries and affiliates of AT&T Inc. under the AT&T. 2Limit 5 shows on 5 devices at once. Only select networks included in your package are available for live streaming and may vary by location and device. All functions and programming are subject to change at any time. High speed internet is required. Wireless use incurs data charges including overages. Functionality varies by compatible device. Visit directv.com/startwatching for complete details. You must have an active directv.com account in order to receive programming. AT&T customers may use their att.com login credentials. Programming should be available to access within 30 minutes of order until the time your DIRECTV System is installed, no more than two weeks. The service will automatically discontinue if your installation is not completed within 14 days from date of order. This offer is subject to change at any time and pay per view programming is not available for purchase during this period. 3 *Limited time offer (Ends 1/7/16 in Puerto Rico) Avail at select AT&T Locations (not online or through DIRECTV). View req's 2-yr wireless agmt & elig. data svc ($45 activation & up to $150 early termination fees apply). DIRECTV req’s 24 month agmt & activation of SELECT™ pkg or above (up to $480 early cancellation fee). Add’l fees, other charges & restr’s apply. See an AT&T store for details. 4Limited time offer (ends 1/7/16 in Puerto Rico). Avail at select AT&T Locations (not online or through DIRECTV). Existing DIRECTV customers only. Requires service to be installed, active & in good standing. Elig. wireless service is req’d on the smartphone & View. Activ., early termination & other fees, charges & restr’s apply. See an AT&T store for details. 5Qual. mobile device, TV plan, online account login and data connection req’d. Not all channels available. Content varies by device, TV plan and viewing location. Wireless use incurs data charges including overages. 9Tax due at sale. Req’s well-qual. credit, 20-month 0% APR installment agmt & elig. data svc (which is add'l). Balance due if svc cancelled. Fees, other charges & restr’s apply. See an AT&T store for details. 102-yr agmt req’s qual. svc (voice & data). Activation/upgrade (up to $45), early termination (up to $325) and other fees, charges & restr’s apply. See a store for details. 11Mobile Share Value requires min. plan charge ($30/mo.) plus per device access charge ($10 to $40/mo.). Other monthly, overage & other charges, fees & restr’s apply. See att.com/msv for plan details.